Milan-born chef Marco Corricelli strikes out on his own with this wonderfully rustic osteria. Osteria Celli opened in late 2015 in the Publix-anchored plaza at Summerlin and Winkler roads. The restaurant belongs to Chef Marco Corricelli, a transplant from Milan. 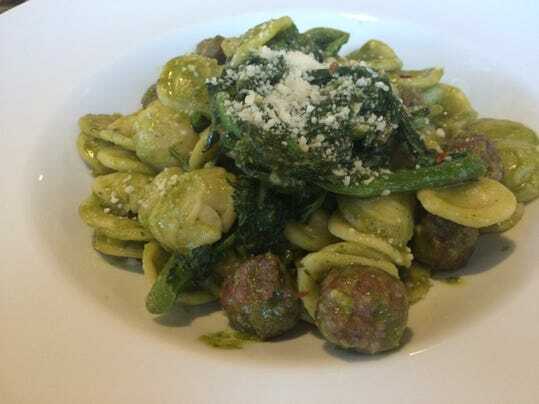 Celli’s strength is its fresh, rustic food. The loud dining room and slow service were minor flaws. If ever there was a case for a $20 plate of pasta Bolognese, Osteria Celli makes it. The dish comes out as a hearty tangle of fettuccine, meat sauce and shaved grana padano. “I could make this at home,” you think. And then you take a bite, and realize how deliciously naïve the you-of-five-seconds-ago was. The meat-strewn sauce strikes a luscious balance of sweetly tart tomatoes, rich beef, bright herbs. But those noodles are the star. The springy ribbons have an al-dente bite, a light chew that calls to mind flour-dusted Nonnas hunched over counters, rolling pins in hand. The person responsible for all this wonderfully rustic Italian fare is Celli’s Milan born chef-owner Marco Corricelli. He’s the dark-haired man roaming the open kitchen in a white chef’s coat with Italian flags emblazoned on the sleeves. Take his lumache — in Italian the word means snail. At Osteria Celli it’s a beautifully garlicky version of escargot, presented in little, sputtering pools of butter that are almost as good with bread as the plump mollusks themselves. In a nod to Southern Italy there are skewers of grilled octopus, the tender legs served atop a bed of kale marinated in lemon and olive oil. Corricelli veers north with a velvety pate made from chicken livers and fat and sweetly caramelized onions. An oval of burrata, a soft cheese made from mozzarella and cream, crowns a bed of arugula and wisps of coppa ham for a fine salad. In another, more of that softly marinated kale joins chickpeas, dried cranberries and shredded carrots under drifts of salty, nutty pecorino. These are dishes worthy of discussion — on the relative merits of the trendy kale plant, or the supple texture of that octopus — which is too bad because at peak times Osteria Celli is a cacophony. Its lustrous granite counter is a beauty to behold, but joined with the tile floors, the drape-less windows, the wood-veneered tables it becomes just another sounding board drowning out attempts at conversation. The good news is this is Southwest Florida, so by 8 p.m. peak time is over. You can concentrate on your little ears of fresh orecchiette pasta tossed with sausage, chili flakes and sautéed broccoli rabe; on your spaghetti carbonara made with cubes of the pork-cheek bacon known as guanciale, fresh eggs and a healthy dose of cracked pepper. And on a slightly bitter note, you can ponder how such a juicy hunk of brasato looked so horribly unappetizing on the plate — like a wobbly mass of charred flesh set next to a cafeteria scoop of mashed potatoes; and you can wonder aloud when, if ever, the server will finally bring the check (it came, with apologies, a good 10 minutes later). As the clock ticks toward 9 p.m., things get even more interesting. Men with slicked hair and barely buttoned Polo shirts make their way to the booth nearest the kitchen. They speak Italian and head out front from time to time to smoke. They shake hands with Mr. Corricelli, nodding happily as he presents each dish. Osteria Celli isn’t always perfect. But if these guys approve, who am I to contradict? Jean Le Boeuf is the nom de plume of a local food lover who dines at The News-Press’ expense. Follow the critic at facebook.com/jeanleboeufswfl or @JeanLeBoeuf (Twitter). •Etc. : Beer and wine only, wine list is exclusively Italian with interesting, well-priced selections from Umbria, Sardinia and throughout the country; outdoor seating; reservations accepted.